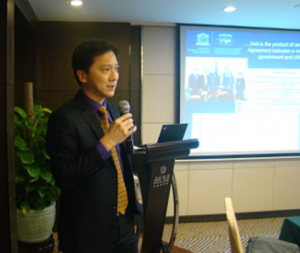 On 25 – 28 May, 2015, ICIWaRM’s Wen-Huei Chang (IWR) and Stanford Gibson (HEC) attended the UNESCO International Hydrological Programme’s International Sediment Initiative (ISI) Programme Planning Workshop in Beijing, China. The workshop was hosted by the International Research and Training Center on Erosion and Sedimentation (IRTCES), which like ICIWaRM is a UNESCO category 2 center. About 25 experts and practitioners from government agencies, academia, UNESCO centers and offices across the world attended this workshop. Drs. Chang and Gibson presented ICIWaRM’s work on international IWRM and engagement with other UNESCO centers, and sediment management in Mississippi River. They also exchanged ideas for the future ISI programme and especially concerning opportunities for collaborative projects with partner agencies within the framework of the ISI objectives. Participants included the ISI Chair, Prof. Manfred Spreafico; Director of Department of International Cooperation, Science & Technology of Ministry of Water Resources of China, Mr. Zhao Hao; UNESCO Beijing Office Programme Specialist for Natural Sciences, Dr. Hans Dencker Thulstrup: UNESCO Programme Specialist for Hydrological System & Water Scarcity Section and IHP Secretariat, Dr. Anil Mishra; the Vice Chair of IHP China, Prof. Heng Liu; and IRTCES Deputy Director, Prof. Duihu Ning. On May 28, participants undertook a study tour of the Daxing Experimental Base of China Institute of Water Resources and Hydro Power Research (IWHR), where they examined sediment research laboratories, hydraulic machinery demonstrations, and irrigation and drainage research projects.